The following interview is taken from Discovering Iceland. Hi Edward, can you tell us a little bit about yourself? Yes, sure. I’m from Shropshire, in the UK, and I’ve been bitten by the Iceland bug. I’m obsessive. It’s kind of like an addiction. I wouldn’t describe myself as an author. Oh don’t get fooled by this answer. Edward is an author, and a really good one too. After reading just a few sentences a was drawn by his writing, adventures and anecdotes! Where does your Iceland fascination come from? Well, I’m fascinated by cold places and the sub-arctic in general. I really loved my time in Alaska, for example. Iceland is top of the list, of course. When did you decide to publish a book about Iceland? I needed a way to record my adventures in Iceland. When an Icelandic friend suggested writing a book, I jumped at the idea. It then took about six years to research and write. I didn’t realise at the time that it was such an Icelandic thing to do. The book is dedicated to your two girls. Do they enjoy Iceland as much as you do? The two girls referred to are my wife and my daughter. My wife loves Iceland too, and accompanied me on most of my trips. My daughter is only two, but she has already been to Reykjavik and she seemed to like it. We both like puffins. What’s your favorite place in Iceland and why? Hmm. Tough question. I love the Snæfellsnes peninsula and the way that it is described as ‘Iceland in miniature’, although this doesn’t do it justice. I was really taken with Stykkishólmur, which seemed to have everything I would need in such a gorgeous, fantastic location. What’s your fav Icelandic band? Easy. Sigur Rós. I’ve seen them play more concerts than I can remember, including one from behind an artificial waterfall in Reykjavik, and a really intimate acoustic performance in London. Okay, I could have guessed that one. Edward talks about Sigur Rós quite a lot in his book. But also other Icelandic bands, artists like Snorri and the very popular Iceland Airwaves Festival caught his attention and earned a mention in the book. Íris played at your Book Launch. You must be a big fan of her? Íris is a fantastic performer, and has the most wonderful voice. I found out about her from Karolina Fund, where she was crowd funding her debut album. She played at the Embassy of Iceland in London at my book launch, and then kindly played the Reykavik launch too, at short notice. She is really sweet; she even gave me tips on performing before I made my speech! Whats your fav Icelandic author and/or book? Well, you are spoilt for choice with Icelandic literature, as you know. There are many ‘classics’ I could talk about, but recently I really enjoyed The Hitman’s Guide to Housecleaning by Hallgrimur Helgason. It gives such a clear perspective on Iceland today, with a story that it utterly addictive. Whats your fav Icelandic food? You could call Edward world’s biggest skyr fan. He even found skyr in New York and went looking for the guy who makes his own skyr in the big apple. Can you imagine? Oh yes, I agree with you on the skyr. It’s absolutely delicious. But I must ask, since I know you’re very fond of puffins. 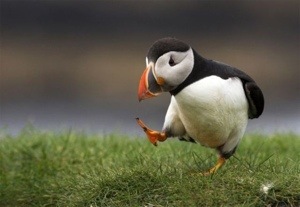 Yes, I’ve tried puffin. I think it’s an acquired taste – I much prefer reindeer! In your book your mention you could really live in Reykjavik. Why don’t you live there yet? Haha! There are many reasons; far too many to list here. They would bore you rigid too. One day though, definitely. Edward dedicated quite some pages to puffins. He thinks they are great little birds and is fascinated by their appearance and habits. How’s the book doing so far? And do you receive many reactions from readers? It’s doing really well, better than I ever expected. The initial print run sold out quickly, and there has been a lot of interest. The best bit though, is hearing from people who have read the book and can relate to it, or just write to say how much it has inspired them to travel to Iceland. Last but not least, where can people buy your book? Amazon in all territories, Smashwords, iBooks, and all good book stores. If that fails, my publisher, SilverWood books sells them directly. In Iceland, you can get a copy at Eymundsson. Do you have any other plans considering Iceland? Yes, of course. I have plans to visit the east fjords, the interior and just to return to spend time in my favourite country, relaxing in hot tubs whilst drinking beer with friends. Sounds great Edward! And thanks so much for writing Iceland, defrosted. It’s fun, educating and very well written. Keep up the traveling and the writing. Photo courtesy of Discovering Iceland.